Bok Kai Temple. Photo courtesy Sue Fawn Chung. 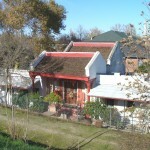 The first Bok Kai Temple was built in 1854 and replaced in 1880 after being destroyed by a fire. Bok I (or Eye) is the central Deity at this temple; who is believed to possess the powers to control floods, waters of irrigation and the rains. This is the only temple that honors the Water God of the North. Unsurprisingly, the temple was built along the Yuba River, prone to excessive flooding in the 1800’s until the current levee network was built. Today, this temple is still active, and on the weekend closest to the second day of the second month of the Chinese New Year, the Bok Kai parade and Bomb Day is held. 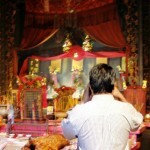 Thousands of Chinese and Asians journey to the Bok Kai Temple to worship. The activities of Bomb Day involve firing off of firecrackers where you Chinese scramble for “good fortune” rings. The rings may be kept by those who retrieve them in the scramble, but are often sold to people who want to keep the lucky rings for the year. 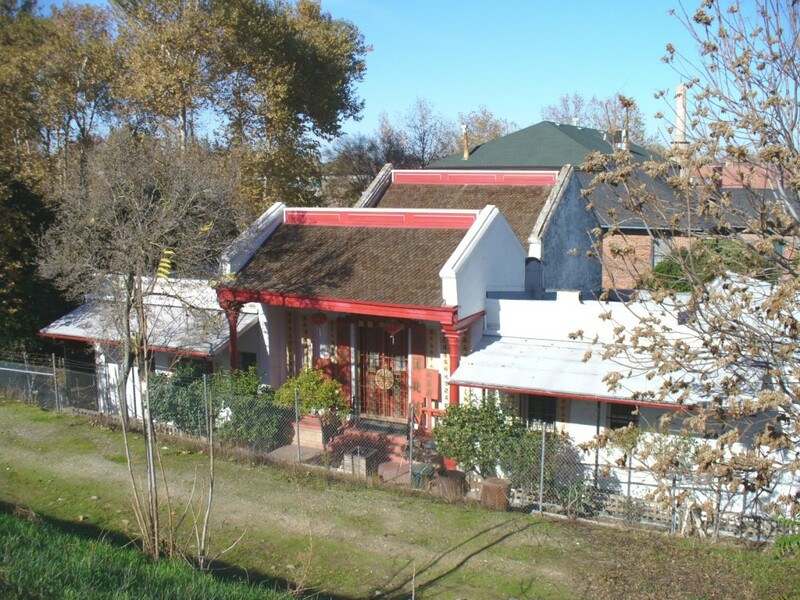 A few blocks away is the Chinese American Museum of Northern California. This Museum emphasizes the forgotten history of Chinese in America. The Chinese built over thirty Chinatowns in California during the gold rush. Almost all have been destroyed or abandoned, so little exists to remind us of their importance in the early settlement of this state. The Marysville Chinatown is the last Chinatown of the gold rush era. It still has an active temple, the old Chinese school building, three Chinese associations and a traditional Chinese festival. The building where the museum is housed is an original gold rush building built in 1858. Nearby the museum are the Chinese School at 226 1st Street and the Hop Sing Tong Building at 109 C Street. 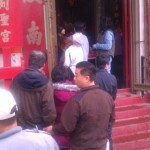 Worshippers lined up to enter Bok Kai Temple. Photo courtesy Sue Fawn Chung. Worshippers inside Bok Kai Temple. Photo courtesy Sue Fawn Chung. 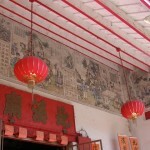 One-of-a-kind hand-painted fresco above Bok Kai Temple. Photo courtesy Sue Fawn Chung.